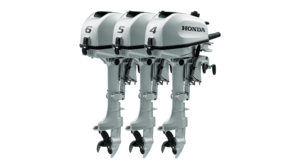 Outboards that produce 20 horsepower that are actually portable – you better believe it. With well-positioned foldaway handles, they’re perfect for all boats that need pocket-sized power. 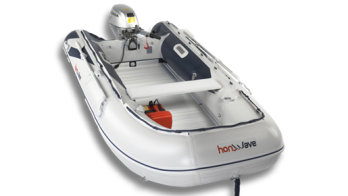 If you’ve got an inflatable boat, a RIB or a tender, these engines are not only easy to transport, they’re easy to operate too. 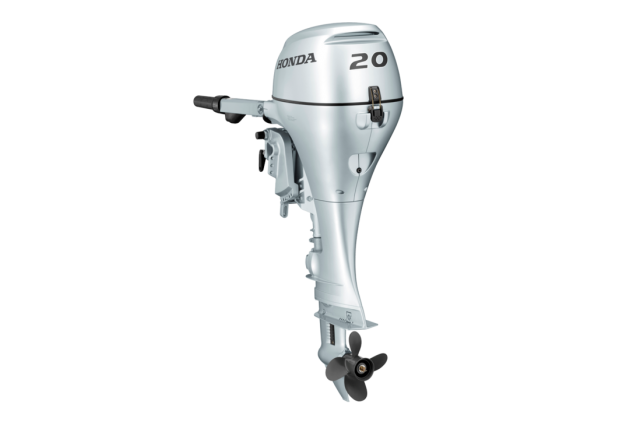 In forward motion the propeller will drive normally through water, but in reverse it’s a different story – unless you have a Honda. On other outboards, the propeller will turn in exhaust bubbles and wont ‘hook up’ with the water. Our unique reverse exhaust relief system directs the exhaust bubbles away from the propeller, so that it can ‘grip’ the water – instead of air. The result is instant reverse response with much finer control. The light engine is easy to tilt up in five stages. Both the manual and power versions will lift up or down, enabling you to trim the boat to give you maximum performance and fuel efficiency. It also stops you from damaging the propeller blades when you find yourself near rocks or the water’s edge. Engines have an automatic decompression system for easy starting. This makes the engine much easier to turn over for that initial pull if you have a manual recoil-type, and it’s less of a drain on your battery if you have the electric start. Engines have a Forward Mount Shift Lever for fingertip gear changing. It’s so much easier to operate and better located than on other outboards, whether you’re left or right-handed. Together with a soft-grip throttle handle and a twist-lock, it’s effortless. You can just roll on and off the power all day long, or lock it off – just like cruise control. They’re so quiet you can raise the power, without having to raise your voice. Whether it’s for commercial or leisure use, when the 4-stroke spins into life you’ll notice how quiet it is as you roll on the power. And with the exclusive Honda rubber mount device that soaks up the vibrations, it feels smooth too. These high-output outboards will push you and your passengers nicely through the water when you’re out for a day’s work, or cruising and fishing. Now, that’s something worth talking about. Our engines have a reputation built on reliability, superior fuel-efficiency and low emissions – so the environment will love you for choosing a Honda. You’ll be glad to know these light 4-stroke 350cc engines are easy to start, that’s because they have a decompression system and a Programmed ignition (PGM IG). This ignition system accurately delivers the right amount of fuel/air mixture to the twin cylinders, so when you fire up these Hondas – even from cold – they’re ready for fun, right from the word go. These compact engines are not only smooth operators, they’re robust and perfect for commercial use too. They have a high-output charging coil, which will support most electronic equipment you have on board – even at lower revs and slower speeds. The finish is stunning in Honda aqua marine silver. And with a folding handle on the exact point of balance, even carrying it around the outboard looks fantastic. Engines are available with tiller handle and remote control options. The remote control option visually displays engine alert lights, oil pressure and overheating. It also produces an audible warning to attract your attention should anything happen while you’re concentrating on other tasks. It’s unlikely – but if there is an issue, you’ll have time to act. LHSU With a 563mm shaft, 12A battery charge and remote. LRU With a 563mm shaft, 12A battery charge and remote. SRTU With a 433mm shaft, 10A battery charge, remote and power trim and tilt. LRTU With a 563mm shaft, 12A battery charge, remote and power trim and tilt.